The restoration on top, the part that you see. Some implant systems blend a few of these elements together, however the list above is relatively standard. In times of extreme force applied to the restoration we don’t always want that force transmitted down to the dental implant. If the tooth implant were to fail then it can be a very costly procedure, therefore sometimes implants are designed with this screw which connects the transmucosal element to the implant as a failsafe mechanism. If too much force is applied to the restoration then this screw breaks, this protects the dental implant itself and means the repair, by way of replacing the screw is relatively simple, cheap and quick to do. Nothing is as good as your natural teeth so we always recommend treating implants as second-best to keeping your natural teeth wherever possible. Why are implants best for tooth replacement? One of the things your dentist will always be wanting to do is to keep as much of your mouth intact and as healthy as possible. Dental bridges often mean reduction of the teeth either side of the gap in order to accept the new single tooth replacement. A dental implant on the other hand does not require reduction of adjacent teeth. A dental implant also can help to stabilise gum in your jaw bone around the new tooth or teeth. When a tooth is lost the surrounding bone tends to collapse into the gap, this can lead to a loss of bone height around the gap. Having a dental implant placed immediately after a tooth is lost can help to prevent bone grafting in the future. Can look like natural teeth. Support the surrounding bone and prevent it resorbing. Often the most cost-effective option when considered over the life of the implant. A wide range of options on how to restore the implant including crowns, bridges and dentures. Can last for many years. May be the most expensive way to replace missing teeth in the short-term. A lengthy procedure including implant surgery. Do dental implants work like real teeth? A successful implant can work exactly the way a natural tooth works. They effectively work as a replacement tooth, looking and working the same as a natural tooth. A dental implant does not have a periodontal ligament around it like a natural tooth, this acts like a suspension mechanism to protect the tooth. All forces placed onto the dental implants are transmitted directly to the bone. What do they really feel like? Once an implant is placed and the teeth and gums have healed then the restoration attached to the implants will feel like natural teeth. The only exception to this rule is if you have removable dentures. Which is better, dental implants or bridging? Bridging often involves removing tooth structure from teeth either side of the gap that you wish to fill. If this tooth structure is healthy then this can mean potentially compromising the dental care of adjacent teeth. Dental implants on the other hand do not need to involve teeth either side of the gap meaning they are a more conservative option. What’s better, dental implant or partial denture? Modern dentures can look extremely lifelike and be very effective. However if you have a partial denture it will almost certainly have some form of clasp around the tooth as well as a plastic area which touches the gum and other teeth. A poorly fitted partial denture can irritate this delicate gum and cause recession. Partial dentures are however much cheaper than dental implants but because that are often made of plastic have a much higher fracture rate. With proper care and attention as well as a dedicated dental team dental implants have a success rate of up to 98%. The implant itself will invariably be made of medical grade titanium, amazingly the human body does not recognise titanium as a foreign object and so the bone will fully integrate with the dental implant. This makes titanium a truly biocompatible material to use. Acceptability of treatment e.g. surgery etc. A common question is do dental implants hurt? Whenever you have any invasive dental procedure you will always be given a numbing injection. This is usually the most painful part of any treatment. To help with the injection we recommend asking your dentist to use a numbing topical gel first, this gel gently numbs the gum so that when the needle goes in there is minimal pain. You may also find that there is some mild discomfort after the dental implant has been placed, particularly in the days immediately after the surgery. Over the counter painkillers can usually help with this and the pain normally subsides after a few days. How many implants am I likely to need? In both cases the outcome is the same, implants restore your ability to smile, eat, chew and laugh again with confidence. Many patients also find that their dignity is restored and their ‘dental comfort’ is massively improved. If you have more than one tooth missing, then we will often place 2 (or even more implants) and ‘bridge’ the gaps as highlighted by the arrow in this photograph. The custom made crowns that fit over the top of implants ensure that you will not see any metal and will be made to blend in to your surrounding teeth invisibly… no-one will ever know you ever had teeth missing. If you have all your teeth missing then you will either need a denture, or a ‘full arch implant bridge’, dentures are explained below, but a full arch bridge will usually involve the placement of around 4-12 dental implants (it depends on your exact situation as to how many you will need). Screwed gently to these implants will be a full new set of teeth which you are not able to remove yourself (we can remove them for deep dental cleaning periodically). This is often the preferred option for patients with no remaining teeth as often a full arch bridge can be made to look exactly like your own teeth. In some instances, with all implants, we may find that additional surgical treatments such as bone grafting are required. 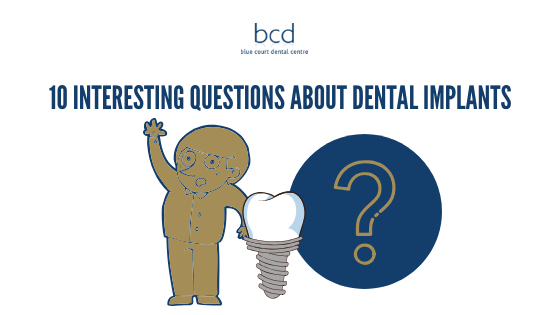 These are explained later on in this guide, but only a full clinical assessment by one of our implant specialists will tell for sure. If you currently have dentures and find that they are loose, then dental implants can help enourmously. We simply place 2 or 4 implants gently in to your mouth, then place some ‘clips’ inside the denture (like a press-stud), this means you will hear an audible click as your denture locks in to place. Depending on your exact situation we may decide that making a new denture is best for you, or we may even be able to convert your existing denture. So if you wear dentures and feel you are not able to go out for a great meal with your friends then this could be a perfect solution for you. Blue Court Dental Centre provides dental implants in Harrow for the local people, including Wembley, Stanmore and Greenford. This entry was posted in Dentistry on 18 December 2018 by Dr Nishan Dixit.